Many Kent businesses and organisations prefer a local website design company who knows the local area and is nearby for meetings and visits. We have a large portfolio of satisfied clients within Kent, many of whom have recommended our Kent website design and maintenance services to other local businesses or organisations. Initially we created multiple stylesheets to allow the website to be viewed differently according the different needs of people with visual impairment. Previously there were 4 different versions of each page creating higher maintenance costs and allowing different versions to show different content. We designed a Parish Council website for Boughton Monchelsea parish council, allowing the council to publish minutes of meetings for the general public to view. 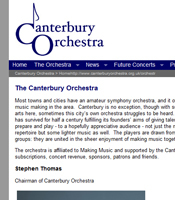 Initially we designed a 1-page website to publicise the Canterbury orchestra's activities, and for several years this was on the top page of the search results for the main relevant search phrases. In 2005 we added a few extra pages to maintain the effectiveness of this website. Cornish WebServices specialise in search engine optimised and accessible websites that conform to the UK DDA (Disability Discrimination Act). In fact we do not create any other type of website. We can design websites to Bobby AAA and WAI AAA standards, so that they are easy to read and navigate using screen readers and other technologies. The same webpage viewable with different style sheets. The Kent Assessors website www.kentassessors.org.uk is a small website that uses several different style sheets to allow the user to switch between standard formatting or large text (either yellow on a dark background or black on a light background). The ability to switch appearance is also used on the much larger Kent Association for the Blind website - www.kab.org.uk. Accessible websites are important for two reasons - firstly they allow partially sighted or blind users and those who cannot use a mouse to read the website. But also because "Google is blind" accessible websites naturally gain high rankings within the Google, Yahoo and MSN search engines. These are a marketing tool, giving information on the services or products offered, and how to contact the business or organisation for further information. These will usually have several pages, email links, and maybe contact forms. They will be linked to various other related websites and well marketed to search engines. For businesses within the UK and within the EU, there are laws regulating e-commerce and email marketing. This has an impact on any website that sells products or collects email addresses. It is actually the responsibility of the business (and not the webdesigner) to ensure the website complies with this law. There are still many UK web design companies creating websites that do not conform to these standards. Cornish WebServices design websites to be highly visible to search engines and ensure the website is listed in the appropriate directory listings. We are able to revamp existing websites to make maintenance easier and to make the website more accessible to all users and to search engines. For example, one tourist website now receives an order of magnitude more visitors per month than the previous website received in a year. For business websites that we design, we consider the website marketing from the beginning. This is much more cost effective than trying to search engine optimise a good looking website afterwards. In some very competitive markets it may be necessary to use forms of paid advertising such as PPC (pay per click). If this is the case, then any PPC campaign will be much more cost effective if the website was designed to be highly visible to all search engines. An example of this type of website is www.riverstillsphoto.co.uk, a commercial photographer based in Gillingham, Kent. The majority of our websites perform very well (top pages of the search engines) without any PPC advertising. However it can take several months to achieve these top positions. For organisations not wishing to invest in a database, then we can create easy to navigate websites using drop-down menus. We are one of very few web design companies that can design an accessible website with a drop-down menu. Not only does this ensure the website conforms to current UK disability legislation, it also helps the website perform very well on the major search engines. Cornish WebServices can also create large company websites with a standard layout across a large number of pages, to give a uniform corporate feel. We make use of the latest stylesheet techniques, and this enables the look and feel of the entire website (maybe with hundreds or thousands of pages) to be changed very quickly and economically if the need arises. An example of this type of website is www.datacapture.co.uk, a document management company based in Slough, Berkshire. We are able to maintain and update existing business websites, provided that we can gradually adapt the website code to become more accessible and search engine friendly. A significant part of our work is actually performing search engine optimisation on existing business websites. We are able to upgrade existing websites to make them conform to the accessibility requirements, or to make future maintenance easier. For The Kent Association for the Blind we made some changes to make the website easier to maintain, and upgraded the code to conform to the WIA accessibility standards. We have also redesigned the appearance of the website. This website makes use of different stylesheets, enabling visually impaired users to view large text in either black on white or yellow on black as well as the standard styling. This website also receives online donates and online sponsorship for the London Marathon. The Voice of the Listener & Viewer already had a large website of over 50 pages. We redesigned the website to update the appearance, improve the navigation and make future maintenance easier. We added contact forms and a search facility. Both of the above websites are now being maintained by the respective organisations, with many pages of each website being regularly updated. Within Cornish WebServices we have experience of developing such database driven websites for other organisations. We are able to design and create the databases, or to utilise the client's existing database. A database management system for photographs or other image files. The administration part of the website is only accessible by an authorised user. using a database enables different searches to be performed to list the required images. Database websites are also commonly used to list product information for shopping carts, or as a way of organising large numbers of documents. Dynamic or database driven websites are also used internally (on an Intranet) within large organisations or on member only areas. Contact us for examples of this type of work. Cornish WebServices have the expertise to design and create such applications. We may make use of commercial 3rd party software, depending upon the specifications required. For many businesses, the Internet has become a major source of sales. One example of this is BuyLocalBooks. This enables a local publisher to sell local history books online by credit card. The website uses the Pay Pal system to receive credit card payments securely. For much of the stock this is now the major method of sales. Cornish WebServices can implement payment systems by the major payment systems such as PayPal or SECPay. Contact us for more details. School websites are usually aimed at parents, prospective parents and pupils. School websites are usually marketing and/or communications tools. Also important with schools websites are registering with ICRA (safe surfing) and child protection guidelines (no children's names and no portrait photos of children). When designing a school website, the issue of how to keep the website content up to date must be addressed. A simple, effective and up to date school website gives a very positive impression. Conversely, an out of date school website with large amounts of missing information gives a very poor impression, irrespective of the website design. The Sturry Church of England Primary School website www.sturry.kent.sch.uk is clear and simple for children to use. The different pages give an idea of the facilities and large range of learning activities at the school. School websites need not be created or maintained by the IT department or teacher in charge of IT. When a school produces a written prospectus this is not always handled by the Head of English! A school website may be thought of as an online prospectus. For larger schools or private schools, a school website can offer a form to fill in requesting the prospectus. Cornish Webservices are able to maintain school websites, or to update the website contents of existing websites. Examples include St Francis' College in Hertfordshire. School websites are a marketing tool, and this is especially true for independent schools. St Francis' College is a good example of a website for an independent girls school, with the emphasis on providing good quality information about the school but also on being ranked high on the search engines. Some Internet companies offer a standard template or standard content management system with a very large number of pages that will take a huge amount of time to keep up to date. These may look cost effective initially, but if the costs of updating these sites are included, they can be expensive. Cornish WebServices prefer to offer a school website that is tailored to fit the individual's school requirements, and that can easily be expanded as the need arises. We understand that different departments within a school may require a different amount of or style of information to be presented, and we are able to create a website that reflects this. We are able to design and maintain websites for UK Parish Councils. All our websites conform to the Bobby AAA criteria and so are accessible to all, including people who use voice recognition software or who use limited keyboard / mouse functionality. Very few web design companies offer this service, despite new disability guidelines. Keeping such a website up to date is very important. We offer a very low annual maintenance that includes uploading the most recent Parish Council documents onto the website. As an alternative we offer email and phone support enabling someone on the Parish Council or the Parish Council Clerk to keep the web pages up to date and to upload the relevant Council documents. The UK government have a UK online strategy . The plan is to make all government services available electronically to the public by 2005. The e-Government Interoperability Framework (e-GIF) is a set of documents that defines the technical policies and specifications to be used by organisations in the public sector. This will enable documents from different departments and councils to be used across the public sector. The e-GIF also requires that websites conform to certain standards. We are able to design websites that meet these standards. These typically cost between £99-£199. We offer either annual maintenance of the website or we can design a website for the client to maintain. This includes making the website visible to and submitting it to various search engines. It is this marketing of the website that is often not done with DIY websites. We are also able to revamp existing websites; we have particular expertise in making existing websites accessible and conform to the current disability legislation. A website to publicise the Rotary club of Eastbourne's meetings and activities to visiting Rotarians. A website to publicise the activities of the Canterbury Diocese Mothers' Union, including a list of events and an email link. Reciprocal links arranged with other related websites. We designed and created a small website to publicise the orchestra to musicians in or moving to the area. With email link to answer queries and links from various other music and arts related websites. There are two main types of websites for churches. Firstly, the website can give a 'photographic tour' of a church building. The is useful for historic churches and will be accessed by people searching out family history. An example of this type of website is historic Fordwich church. Secondly, a church website can show the life of a church. This should include contact details of the vicar or minister, information on who to contact for baptism or wedding enquiries and a list of service times. Website maintenance is an important design issue. 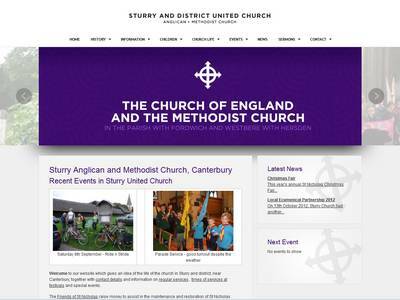 The large Sturry Anglican Methodist church and smaller Westbere church website are designed to require updating no more than three times a year. Within a voluntary organisation, care must be used when publishing names, phone numbers or personal addresses on a website. It is usually unnecessary to include names or addresses. A contact email or phone number is often sufficient. There should be no child's name associated with any photograph containing children. Cornish WebServices have the expertise to design and create accessible Web Logs or Blogs. Blogs allow easy updating of a news style page, without specialist web design skills. An example web log (or blog), - Sturry church weblog - that can easily be updated without knowledge of website code. This particular web log has been designed to be as accessible as possible. For fun, a website that converts messages into a semaphore code, as used in the Swallows and Amazons books by Arthur Ransom. St Francis' College - School website in Hertfordshire, including natural search engine optimisation. Within Cornish WebServices we have extensive experience of creating database driven websites, specifically within the areas of Banking, International Marketing and the Media Business. These websites were designed for other companies and so are not listed under the Cornish WebServices portfolio of projects.